Being Dutch, I had a good reason to want to visit the Santa Maria dell’Anima. Here we can find the tomb of the only Dutch pope in history, Adrianus VI. I had already been to Rome many times since 1996, but somehow never found time to visit this church, which used to be the national church of the Holy Roman Empire. It is now, more than 200 years after the dissolution of this Empire, the national church for Germans and Austrians. Although a Dutch priest is still involved in the administration of the church, the Santi Michele e Magno (or ‘Friezenkerk’) near Saint Peter’s Basilica is now considered the national church of the Netherlands. 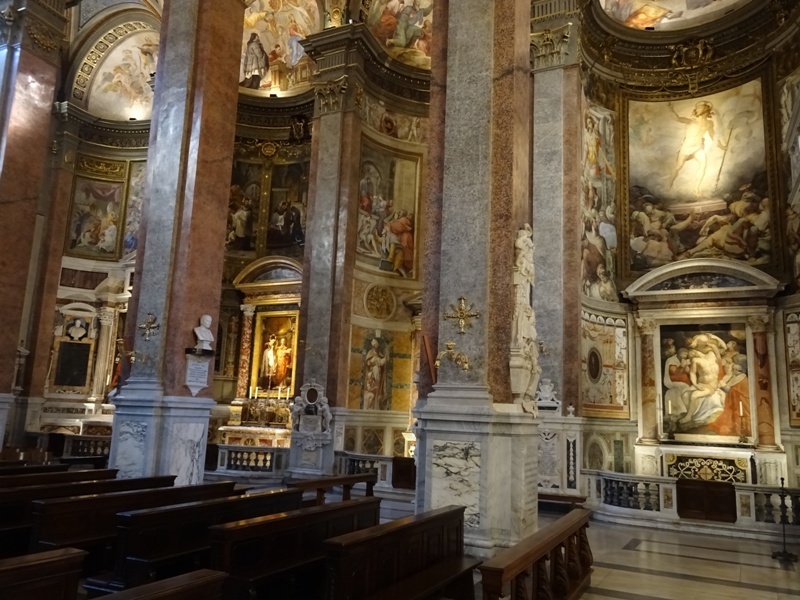 I managed to visit the Santa Maria dell’Anima in November of 2015 and was not disappointed. The origins of the church can be traced back to the fourteenth century. In the light of the Jubilee Year 1350, a married couple from the Dutch city of Dordrecht, Jan and Katrijn Peters (or Peeters) founded a private hospice for pilgrims. They bought three houses in Rome. One of these houses served as a hospice for men, a second as a hospice for women and a third as a chapel for religious services. Although the precise order of events is not clear, we know that the hospice and chapel were placed under papal authority by 1406 on the orders of Pope Innocentius VII (1404-1406). In 1431 a full-fledged church replaced the former chapel, and this church was in turn replaced by a new church towards the end of the fifteenth century. Another Jubilee Year had been declared – the year 1500 – and work on the new church began in 1499. 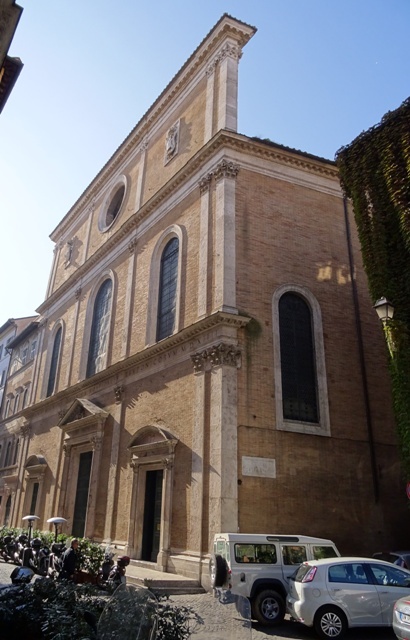 Work was not completed until 1543, when the Santa Maria dell’Anima was consecrated (the text on the facade has a date of 1514 by the way, so it may have been consecrated before it was complete). Madonna & Child, and two souls (anima). 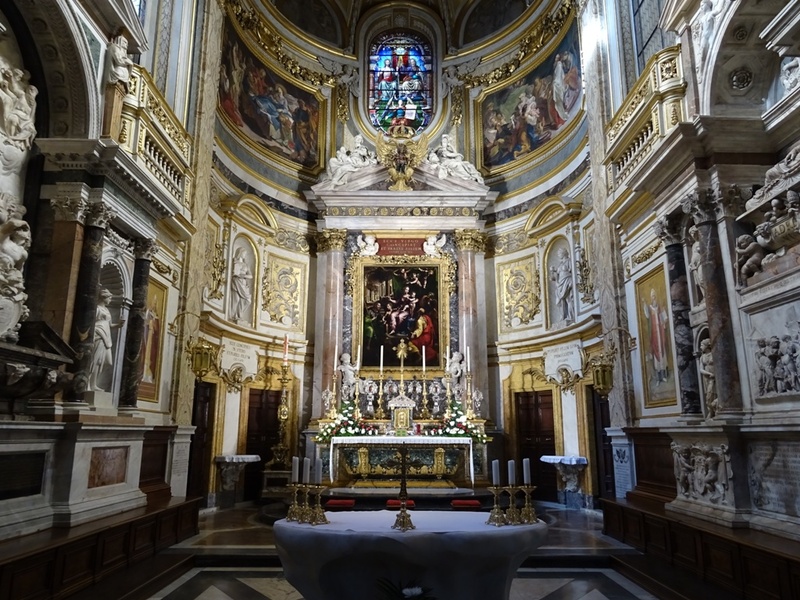 The Santa Maria dell’Anima can be found in a street just west of the Piazza Navona. As the street is quite narrow, it is rather difficult to take a good picture of the church’s facade. The facade itself is unimpressive and there is little decoration. 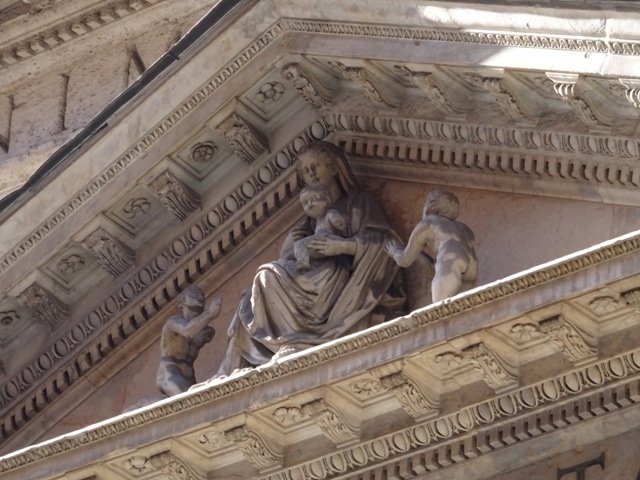 The tympanum above the central entrance contains a relief of a Madonna and Child, flanked by two figures. One explanation is that these are the two souls (anima) from Purgatory from which the church takes its name. The relief is actually a copy of a work by Andrea Sansovino (c. 1467-1529), while the original is kept in the sacristy. The facade has three storeys, but the third storey is actually just a screen with no building behind it (see the picture above). The Santa Maria is built as a hall church, the nave and aisles being of approximately the same height. The interior is quite spectacular. It is mostly seventeenth century Baroque. 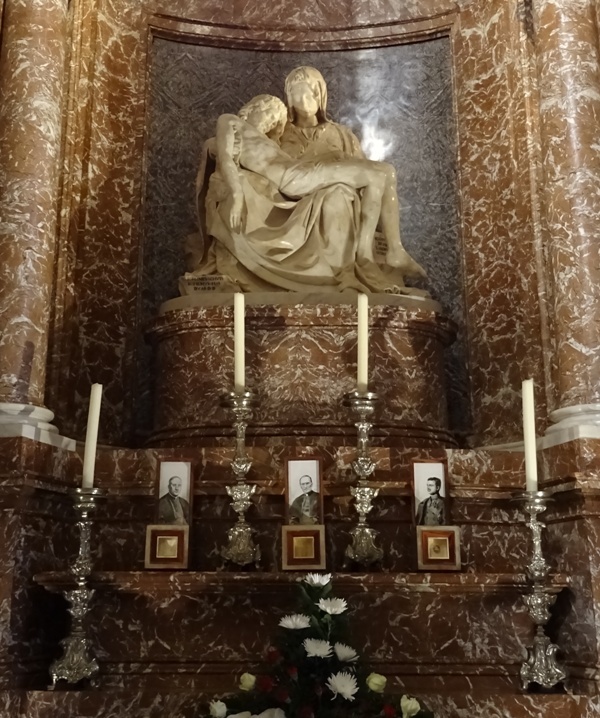 One of the prize possessions of the church is a copy of Michelangelo’s Pietà by Lorenzetto (1490-1541), a sculptor from Florence. The copy – which is not an exact copy – can be found in the last chapel on the right side of the church. A notable difference with Michelangelo’s original Pietà is that Christ’s face is actually visible in Lorenzetto’s reproduction. In the sanctuary, we find a painting of the Holy Family and Saints above the high altar. It is the work of Giulio Romano (ca. 1499-1546) and was painted in 1522. It used to be in one of the chapels of the Santa Maria, but was moved here in 1750. The painting was seriously damaged when the Tiber flooded in 1598 and the bottom part was re-painted by Venetian artist Carlo Saraceni (1579-1620). The text above the painting reads ECCE VIRGO CONCIPIET ET PARIET FILIVM, which is from Isaiah 7:14 and can also be found in the Santa Maria in Trastevere. The beautiful stained-glass window above the high altar has an image of the Holy Trinity, depicting the Father on the right, the Son on the Left and the Holy Spirit in the traditional shape of a dove above them. 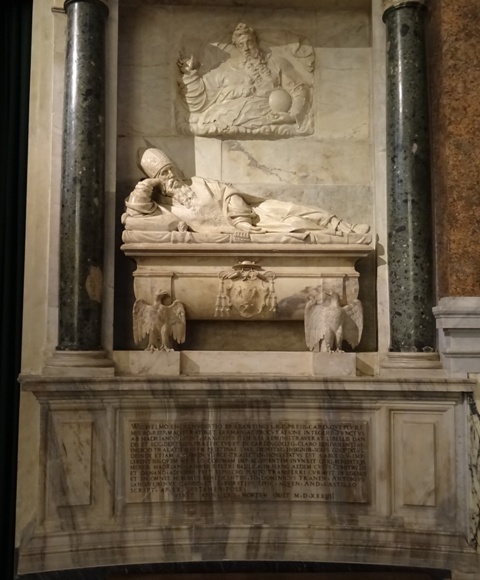 Tomb of Pope Adrianus VI. Pope Adrianus VI was born in 1459 as Adriaan Floriszoon Boeyens in the Dutch city of Utrecht. He was the son of a shipwright. Highly intelligent and a devout Catholic, he became a priest in 1490 and was commissioned in 1507 as one of the tutors of the young prince Charles, the future Charles V, King of Spain and Holy Roman Emperor. In December of 1521, the notorious Pope Leo X – born Giovanni de’ Medici – died. His cousin Giulio de’ Medici was seen as a favourite to succeed him, but he also had many staunch enemies. After a difficult conclave, the cardinals ultimately elected Adriaan on 9 January 1522. He was clearly a compromise candidate. His reputation was stainless, but most of the cardinals had never met him and did not really know who he was. Although Adriaan had himself been a cardinal since 1517, he was in Spain at the time of his election. The new pope did not arrive in Rome until August of 1522. He was 63 years old at the time and not at all happy about his new job. As pope, Adrianus – he did not change his birth name – was never popular, neither with the clergy, nor with the people of Rome. The clergy was unhappy that the new pope did not respect their privileges. The people believed the cardinals had elected a barbarian from the north, with no taste for fun or culture. Adrianus basically lived the life of a monk, spending little money on food and drink, and not at all on feasts. His entire staff consisted of an old lady from Flanders, who cooked his meals, cleaned and did his laundry. Left aisle of the church. Adrianus had no interest in Renaissance art or architecture. He once threatened to paint the ceiling of the Sistine Chapel white or throw the famous Laocoon group into the river Tiber, as he considered it a pagan and un-Christian piece of sculpture. The pope tried to curb the trade in indulgences, but failed. He tried to organise a crusade against the Turks, who had taken the island of Rhodes and had expelled the Knights Hospitaller there, but failed. Like his predecessor, he underestimated the strength of the Reformation movement started by Martin Luther, although he certainly tried to make the Church a sober institution again. After a pontificate rife with disappointment, Pope Adrianus VI died on 14 September 1523, aged 64. His reign has lasted little more than a year, and it would take another 455 years before another non-Italian pope was elected. Adrianus was succeeded by Giulio de’ Medici, who would become notorious as Pope Clemens VII (1523-1534). Tomb of Willem van Enckevoirt. Many commentators have argued that Adrianus would surely have disapproved of the wonderful Renaissance tomb that his friend cardinal Willem van Enckevoirt commissioned for him in the 1530s. The pope was originally interred in Saint Peter’s Basilica and his tomb was located between those of Popes Pius II and Pius III (their tombs were later moved to the Sant’Andrea della Valle). His epitaph was rather ungrateful, as it read: “Hic iacet Impius inter Pios”, or “here lies a sinner between the pious”, with ‘Pios’ of course referring both to the two popes named Pius and the adjective ‘pious’. The epitaph was certainly unfair, as Adrianus VI was anything but impious. In fact, he did try to reform the Church and introduce soberness and religiosity again, but failed miserably. His tomb was executed by Baldassare Peruzzi (1481-1536), the man who also designed the Villa Farnesina. 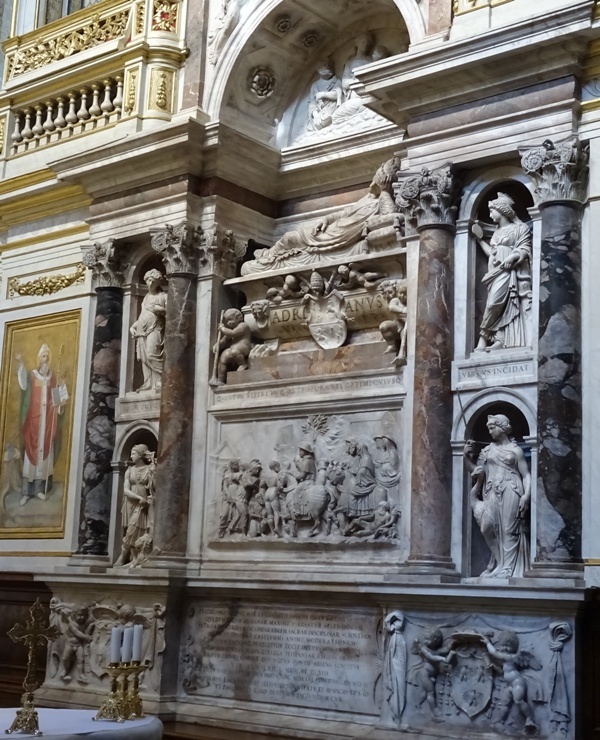 Cardinal Van Enckevoirt’s tomb is also in the Santa Maria dell’Anima. He died in 1534 at the age of 70. The tomb can be found near the church entrance, but many sources indicate it was originally located opposite Pope Adrianus’ tomb in the sanctuary. Van Enckevoirt’s monument is the work of Giovanni Mangone (died 1543). The text on the tomb refers to the cardinal as a “Brabantinus”, someone who is from the Dutch province of Brabant. Van Enckevoirt was born in the small village of Mierlo-Hout, which is now part of the municipality of Helmond. Santa Maria dell’Anima on Churches of Rome Wiki.